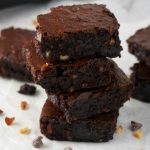 A moist, chewy and chocolatey coconut oil brownies that kids and adults alike will love. Line a 7-inch square baking pan with parchment paper. Preheat oven to 350 F.
In a medium pot over low heat, melt the chocolate chips and cream cheese together with the coconut oil and cocoa powder. Stir occasionally until mixture is smooth. Turn off heat. Stir the sugar to the chocolate mixture in the pot until fully incorporated. Add the eggs and lightly stir it into the mixture to incorporate. Combine flour and salt and stir it into the mixture just until it is combined. No need to over-mix. Fold in the chopped walnuts. Pour batter into the baking dish and spread it evenly across the entire pan. Bake at 350 F for 18-23 minutes. The outer edges should look set and the center may look softer. A toothpick inserted at the center should come out with some bits of fudgy (not too wet) goodness. Let the brownies cool before cutting. Store leftovers in a covered container at room temperature.